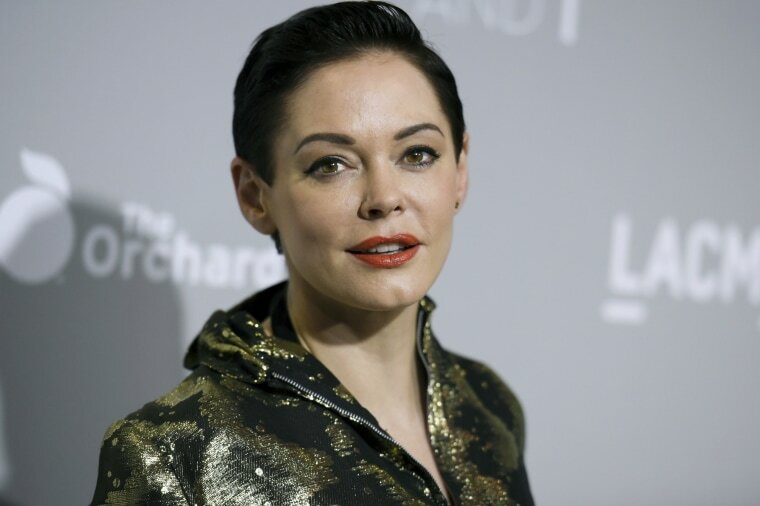 The temporary lock placed on actress Rose McGowan's Twitter account as she posted about systemic sexual misconduct in Hollywood and a culture of silence is raising questions about how Twitter goes about revoking some users' privileges while others are free to keep posting. McGowan used her Twitter account as a sounding board this week to expose a culture of complicity in Hollywood after countless women spoke up about their terrifying experiences with mega-producer Harvey Weinstein. The actress has even called out men who knew about her own experience with the mogul. Then late Wednesday, she was temporarily silenced. "TWITTER HAS SUSPENDED ME. THERE ARE POWERFUL FORCES AT WORK. BE MY VOICE. #ROSEARMY #whywomendontreport," she posted to her followers on Instagram. She shared a message from Twitter letting her know she would be able to browse the site but wouldn't be able to tweet, retweet, or like anything until she deleted the offending tweet. Twitter has long had a history of not commenting on individual accounts, but in the case of McGowan and the explosive allegations against Weinstein, the company has spoken with rare transparency. A company spokesperson told NBC News they had been in touch with McGowan's team regarding a tweet that included a private phone number, violating Twitter's terms of service. Related: Could Ex-Twitter CEO Have Changed the Way Trump Tweets? "We want to explain that her account was temporarily locked because one of her Tweets included a private phone number, which violates our Terms of Service. The Tweet was removed and her account has been unlocked," the company said in a statement. "We will be clearer about these policies and decisions in the future." That tweet in question, which has now been deleted, may have been from October 11 when McGowan wrote: “Anonymously sent to me. They all knew. It starts here,” according to the Washington Post. Attached was part of an email offering to set up a meeting with "Bob," possibly referring to Bob Weinstein, Harvey's brother and the co-founder of the Weinstein Company. The screenshot also included the email signature of the person who sent it, including their phone number. A Twitter spokesperson said the company was committed to protecting voices, like McGowan's, on the platform. Last month, Twitter co-found Biz Stone called a tweet — that has since been deleted — "disgusting" and said he would report it. Stone and another employee, Joshua Cohen, reported the tweet. Cohen said he received a reply that it did not violate their terms of service. "We seem to agree it's disgusting, we work here... what we can we do to fix this?" Cohen asked. I reported it too, @biz, and I just got a response back that the account hasn't violated the rules, so... what now? We seem to agree it's disgusting, we work here... what we can we do to fix this? Jen Golbeck, a professor at the University of Maryland's College of Information Studies, told NBC News she felt the time has come for Twitter to be more transparent. "They don't even understand their own content policies," Golbeck said. "They risk becoming a platform where the powerful are given stronger voices and are allowed to bypass the rules, while the vulnerable — who they claim to give voice to — are suppressed when they speak against power." Twitter forbids threats of violence on the site, yet it also balances newsworthiness in making its decisions. That might explain why President Donald Trump's tweet about how North Korea might "not be around much longer" was allowed to remain on the platform. "This has long been internal policy, and we'll soon update our public-facing rules to reflect it. We need to do better on this, and will," the company said in September. Last year, Twitter permanently banned former Breitbart editor Milo Yiannopoulos after he harassed comedian Leslie Jones. Former KKK leader David Duke and white nationalist Richard Spencer have both been briefly suspended in the past, but are still on the platform. It's also possible McGowan's account may have been flagged by an algorithm and not a human. In March, Twitter's vice president of engineering, Ed Ho, said the company was "working to identify accounts as they’re engaging in abusive behavior, even if this behavior hasn’t been reported to us." Often times, those accounts are identified by an algorithm, which Ho said they know isn't perfect. Those accounts then had some privileges temporarily revoked, much like what happened to McGowan. Some reported earlier this year they had already seen this in action after swearing at famous people. However, a Twitter representative told NBC News the feature applies to anyone who is potentially hurling bad language at someone else. But with so many rules and so many questions about why some people get to stay on the site, and others, like McGowan, temporarily get their privileges revoked, Golbeck said it's time for Twitter to streamline this process. "Transparency and consistently applied rules are essentially the only way to solve the problem," she said. "Twitter has done a terrible job on both fronts."